Paddy Adventures Bali is one of the pioneers adventure company for ATV driving activities offers the great adventures to explore the natures of Bali including agricultures with magnificent view of rice terrace. It will bring you to the fantastic and exciting experience by driving ATV, a four wheel motorcycle which is specially designed for off road environment with 250 cc or 350 cc engine power. Those are completely fun to break through the muddy ground and special track to discover the beautiful of Jatiluwih with amazing panoramic of rice terrace. 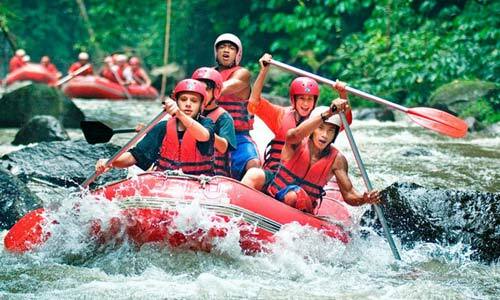 It is totally enjoyable and ready to wet with comfortable atmosphere surround it that always reminds you to return. Due the operator of this activity are not operate anymore, we suggest you to choice another operator for this activity. Paddy adventures will bring you to the exciting experience by starting off road in the muddy ground and continue to magnificent journey. The professional and well trained staff will lead you to discover the most interesting site in Tabanan Regency as the biggest rice sources for Bali Island. Normally one group will be joined by two ATV guides, and the duration for this adventure is around two hours. You will pass three different area like rice terrace field, small forest, and river area. Take a rest for awhile in second area and will get mineral water. The last action you can make a jump with your ATV. After finish back to base camp for taking a shower and take you to hotel. Beautiful scenery of rice fields will be one main attraction in the adventure of riding ATV in Bali.